I am a huge fan of Pinterest! I have over 6,000 pins and 200 boards – numbers that are quickly growing! I am REALLY excited about one board in particular though, so I wanted to take a moment to introduce you all. 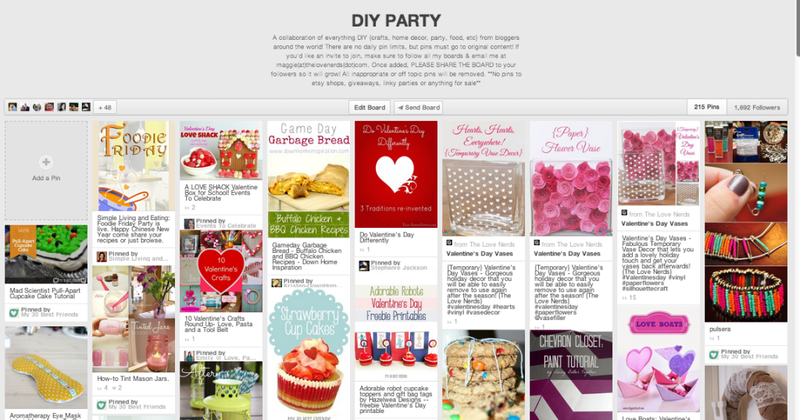 DIY Party is a fabulous one-stop board for all your DIY needs, planning and day dreams!! Over 50 bloggers are already sharing their best DIY, including crafts, holiday decorations, parties, home decor, organization and recipes! You should head over to the board right now and follow along! You should also keep reading about why it is so important to share group boards with your social media followers! If you are a Non-Blogger Pinterest and DIY Fan: I hope you will follow along and be inspired by all of the fabulous pins. The bloggers on this board are some of my very favorite in the creative world and are a constant inspiration for me. They are also my go-to when I am in desperate need for a cookie recipe or a last minute gift idea. They never disappoint, so follow along with DIY Party and then make sure to click on the little number box by the list of contributors and follow along with all of them as well! If you are a Blogger: If you are interested in contributing to the DIY Board, you will first need to follow all of my boards: LoveNerdMaggie Pinterest. Then, leave me a comment below or send me an email with the link and email for your Pinterest account. Either way, PLEASE SHARE! I would deeply appreciate you sharing DIY Party with your friends, family and followers! Pinterest does not automatically subscribe people to group boards, so sharing is caring! It is such a fabulous collection of bloggers, and I want to help support there work as much as I can! And if you are still with me in this post, head over to the DIY Party Board right now! Don’t wait. Do you have a favorite pinner? All I ask if that you share the board with your followers, encouraging them to also like the board and follow along. The more we can grow the reach, the better for all of us!